In this post, I compared scaling on sweet gums in our search area with images of scaling on sweet gums taken by Martjan Lammertink in Congaree National Park; he has graciously granted me permission to post those images and some others here. The focus of the original post was on the direct comparison between known Pileated Woodpecker scaling on sweet gums and the work we are finding in our search area. The differences are quite dramatic. In this post, I will simply include a number of examples of suspected ivorybill work from both our old and new search areas without too much discussion. The differences should be self-evident, even without reference to bark chips. I have come to believe that much if not all of the high branch scaling that Tanner presented as being typical and (by implication at least) diagnostic is not necessarily inconsistent with PIWO work. Thus, in the absence of other indicators, the Steinhagen photos are potentially interesting but not highly suggestive. 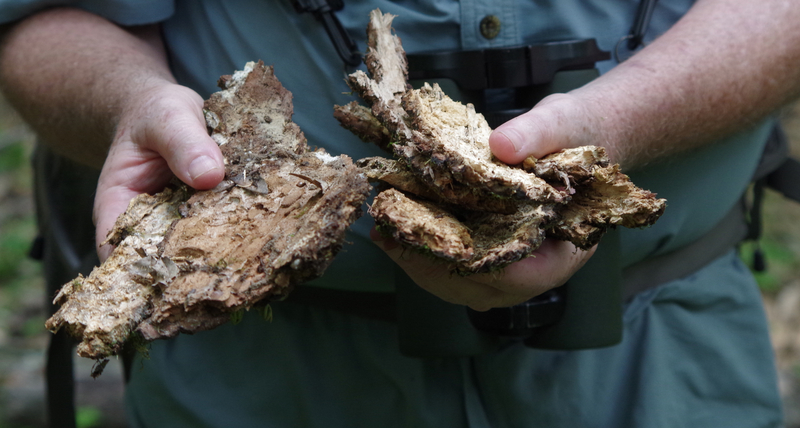 Note that in all three images of PIWO work on boles, there is clear evidence that the bark has been removed in layers. This is true even on the pine, where signs of this layered work are visible on the left, just above the bird. I now suspect the absence or near absence of layering on extensively scaled, tight barked hardwoods may be the single most important component in the gestalt and may even be diagnostic in itself. Even when the scaling is quite extensive, the signs of layering are likely to be a giveaway, as in this example from public land near our old search area. The bark chips around the base of this tree were all small and gave further indication that the work had been done in layers. Most of the images below have been discussed in other posts. The scaling is on oaks, hickories, and sweet gums and the differences in appearance should be self-evident. Hickory Scaling with eyed click beetle and Hairy Woodpecker work. We suspect that there may be a correlation between IBWO and HAWO foraging strategies.